On the 13th of September 2018, Add Hope, KFC and KFC local franchisee AKM Foods staff visited Uviwe Child and Youth Services in Port Elizabeth, Eastern Cape to officially welcome them into the Add Hope feeding scheme. 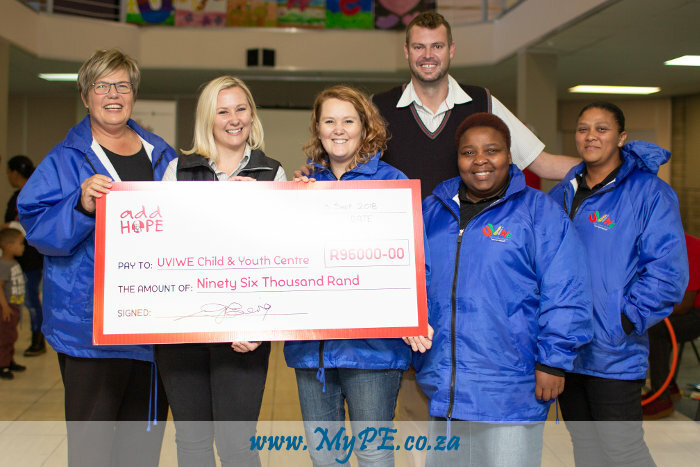 Part of this, involved them receiving a R96 000 cheque handover to help ensure that they can continue with the work that they do in and around the community. The NPO, has, for the past 20 years provided nutritional support to over 300 children at five Early Childhood Development (ECD) centres in the Port Elizabeth region. Every R2 that KFC customers donate to Add Hope goes towards sustainable feeding programmes for children like those under the care of Uviwe Child and Youth Services. Local restaurants can also take part by working with local charities to ensure that funds go to the very communities that they live in.